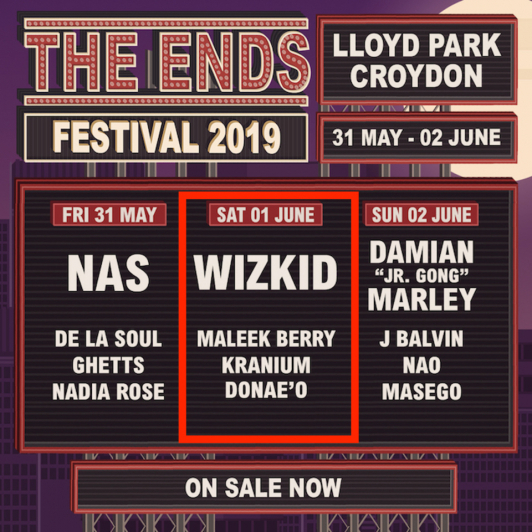 Nas, Wizkid and Damian Marley have been confirmed as headliners for the inaugural The Ends Festival which will run over three days. An extraordinary new field day where music and food will weave together into an exhilarating weekend in the heart of Croydon, one of Britain’s exciting and vibrant boroughs in partnership with Croydon Council. 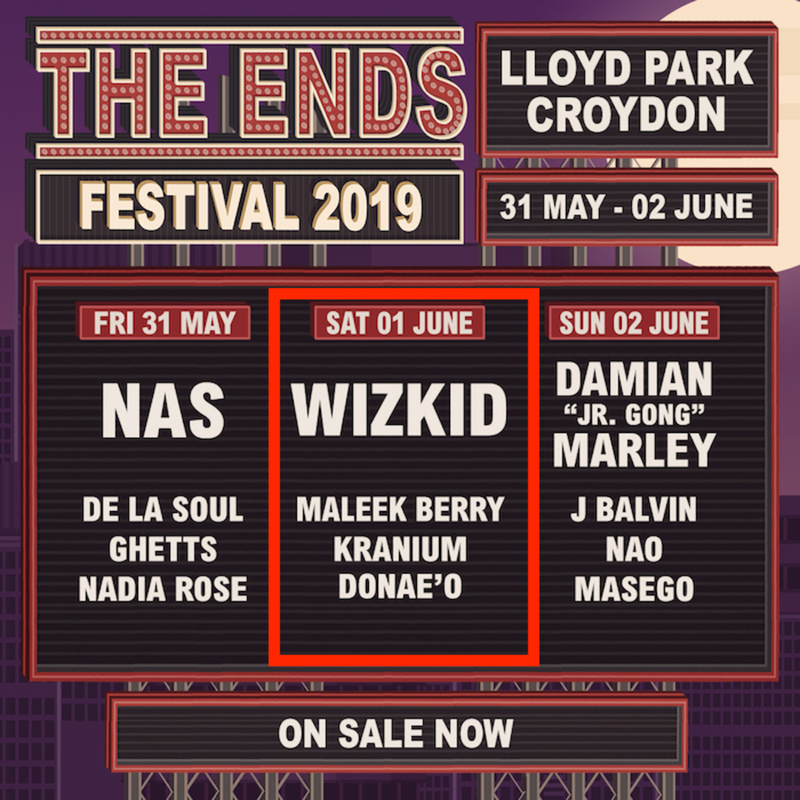 The Ends Festival will be the spotlight of the summer calendar in 2019, taking place in Lloyd Park in South London, Croydon from the 31 May 2019 – 02 June 2019. On Saturday, Nigerian superstar Wizkid will be taking over the main stage performing a number of sensational global hit anthems from the likes of “Soco,” Drake-assisted 'Come Closer,' 'Ojuelegba'' and many more. Wizkid also known as Starboy joins the lineup having rapidly established himself as a world class act. He has collaborated with the likes of Zara Larsson, Kranium, Chris Brown, Wale, Future and the Six God himself, Drake. Wizkid was the first African act to headline Royal Albert Hall coupled with raking up over 200 million streams on Spotify as well as many more accolades. Closing the three-day festival on Sunday will be Reggae royalty Damian Marley. A GRAMMY award nominated, roots-reggae musician, singer-songwriter, humanitarian, Damian Marley certainly continues in the same tradition as his father - Reggae legend Bob Marley. His second album, Halfway Tree, won him a Grammy for Best Reggae Album, and with Welcome to Jamrock, he became one of the stars of 21st century Jamaican music. A first for Croydon, The Ends Festival will see 15,000 music lovers each day flock to Lloyd Park with the festival aiming to engage and inspire local, national, and international communities of composers, performers, creators, and concert-goers through world-class performances.